These men, Sukesha Bharadvaja, Shaivya Satyakama, Sauryayani Gargya, Kaushalya Ashvalayana, Bhargava Vaidharbhi, and Kabandhi Katyayana, bent on the Eternal, following the Eternal, were seeking the Supreme Eternal. And they came to the Master Pippalada, with kindling-wood in their hands, saying ‘He will declare it all to us’. And he answered him: ‘The Lord of beings, desiring to produce, brooded with fervor. And brooding with fervor, he produced a Pair. They were Body and Life. These will make manifold beings for me, said he. ‘The sun is life; the moon is body. All that is formed is body, and the formless [is life]. For form is body. ‘The sun, rising, enters the eastern quarter, and thus guides the eastern lives among his rays. And as he enters the southern and western and northern quarters, above and below and the quarters between, he illuminates all and guides all lives among his rays. —Thousand-rayed, turning a hundred ways, the life of beings rises, —the sun. ‘The circling year is a lord of beings; his paths are the south and the north. Therefore those who worship by purification and sacrifices win the lunar world. They verily return to the world again. Hence those sages who desire offspring turn, to the south. For this is the body, and the path of the fathers. ‘But by the northern path, by fervor, faith, and service of the Eternal, and by knowledge, seeking the Self, others win the sun. For it is the home of lives; the deathless, fearless, the higher way. From it they return not to the world. It is final rest. —And in the other [sense] they say he is giver of wisdom, seated in the chariot with seven wheels of six spokes. ‘The month is a lord of beings. The black half is body, the white half is life. Hence these sages sacrifice in the white half; but others in the other half. And day-and-night is a lord of beings. Day is life; night is body. ‘Food also is a lord of beings; whence seed comes; whence these beings are produced. Hence those who perform the vow for offspring produce a pair. ‘Theirs, indeed, is that eternal world, who have fervor and service of the Eternal, and in whom truth is set firm. To him he answered: ‘There is the bright ether, and air, and fire, the waters, and earth, voice, thought, sight, hearing. They illumining, declare—We support this life, establishing it. ‘Then Life, the chief of them, said: Cherish not this illusion! I, dividing myself fivefold, support this life, establishing it! ‘But the others were incredulous. So Life made as if to go out above ; and as he Went out, all the others went out; and when he returned, all the others returned. —This, as fire, warms; this as the sun, as the rain-god; the thunderer; wind, and the earth; as body; as the bright one; and being, and non-being, and the immortal. —Like the spokes in a nave, all this is fixed in Life. So are the Rig, and Yajur, and Sama hymns; and sacrifice, and warrior, and priest. —Thou art lord of beings in the germ: and thou it is that art born forth. To thee, Life, these beings bring oblations; to thee, who art manifested by the lives. —Thou art the fire of the gods; the first oblation of the fathers. Thou art the wisdom of the sages; the truth of sacrificial priests. —Thou, Life, art Indra with his brightness. Thou art Rudra, the preserver. As the sun, thou movest in the sky ; thou art the master of the stars. —When thou rainest, Life, then these thy children rise up with gladness. There will be food, they say, according to our desire. —Thou art the exile, Life: the lonely seer; the good master of all. We are givers of the first offering ; thou art our father, the great breath. —That form of thine that is manifest as voice, that form, that is in hearing and in sight; that form of thine that spreads as thought; render that propitious! Go not out! And so Kaushalya Ashvalayana asked: Master, whence is this Life born? How does it enter this body? Or, dividing itself, how does become manifest? How does it go out? How does it enfold what is outside? And how as to the Self? And he answered him: ‘Thou askest many questions! But thou art bent on the Eternal, and therefore I tell thee. ‘This Life is born from the Self; and, like this shadow beside a man, it extends beside the Self. By the force of thought it enters this body. ‘Verily, as a sovereign commands his deputies: “Rule over those villages, and these villages!” So also this life guides the lesser lives, disposing them. In the lower organs the downward-life; in sight, hearing, mouth and nose, the forward-life; in the center, the binding-life. This binds the food that is offered, and from it issue seven rays. ‘In the heart is the Self; from thence go a hundred and one channels; from each of these a hundred ; from these seventy-two thousand branch channels. In these, the distributing-life moves. ‘By one channel the upward-life rises; by pure deeds it leads to the pure world; by sin to the sinful world; by both to the human world. ‘As the sun, the outer life rises, linked with the life of the eye, and the potency in the earth enters into and establishes the downward life of man. And the ether is linked with the binding-life; and the air with the distributing-life; and fire with the upward life. ‘Hence one whose fire has burned out is reborn through the the tendencies retained in mind; and according to his thoughts he enters life. But linked by the fire with the Self, this life leads to a world of recompense. The use of symbols is to picture the invisible by the visible. In the Upanishads, one is struck first, perhaps, by the quaintness and old-world flavor of the symbols; and then by their simplicity and natural fitness. For instance, the pupils, seeking the Eternal, approach the Master; who is here as elsewhere the symbol of the Higher Self. The ripening of the mind has been compared to the burning of wood; first a painful struggle and emission of moisture; then blackness and, at last, readiness to burst out into a clear flame. It is this readiness and ripeness that is typified here by the fuel in the hand. The first answer outlines a scheme of cosmic evolution. From the unknowable Eternal arises first the Evolver or Lord of beings; who then becomes two-fold, or produces a “pair”—a duality. This pair is variously named in Sanskrit books. Sometimes it is the masculine and feminine Logos, or the positive and negative Word; here the pair is called Life and Body, or Substance. And from this duality all other dualities proceed; as spirit and matter, the perciever and the thing perceived, the knower and the known. More than one of these dualities are suggested in the Upanishad; as day and night, summer and winter, sun and moon. This brings us to another symbol, as simple and natural as the kindling-wood, though not without the quaintness which gives such a charm to these old books. The sun is therefore the symbol of the Spirit or Higher Self in that seven-fold, perfect man spoken of very clearly in more than one passage of the Upanishads. Opposite the Higher Self is the lower self, as the moon is opposite the sun. This makes clear the symbol of the two paths, the path of the sun and the path of the moon. The path of the sun is the religion of the Higher Self which leads to final liberation; to perfect life in the eternal world. The path of moon is the religion of the lower self; the religion of ritual and observance, which leads to a temporary paradise after death, and then to rebirth in the world, and the opposition, between these two is found again and again in the Upanishads. The second answer leads us to a further step in the cosmic evolution. The Evolver, becoming the masculine Life, and the feminine the three together make up the formative trinity or Triad. The Life of the Evolver, expanding through the Word, produces the manifested universe. This expansion forms a series of descending planes, from the more spiritual to the more material. It is as though a rainbow-colored curtain were let down across the empty stage of space. These planes are symbolized here as the planes of ether, of air, of fire, of water, of earth. And these five, together with the dual form of the Evolver, make up the sevenfold cosmos, corresponding to the sevenfold man; the macrocosm corresponding to the microcosm. Then follow the fable and the magnificent hymn to Life, which can hardly be equalled for majesty and beauty. Its expression is so universal that it hardly needs a commentary; but one thought may be noted. The Vedic gods, Agni, Indra, and Vayu, or Fire, the Thunderer, and Air, are spoken of as forms or facets of the One Life; as representatives or regents of the great cosmic planes and fields of life. They are no personal gods, but personified aspects of the indivisible One. This suggests a clue to much that is enigmatic in the Vedic hymns to one or other of these deities. The whole spirit of the old Indian wisdom is summed up in the burden of this hymn: that all is Life; that nothing is, but infinite, unbounded Life. It is a fact which is brought home by constant study of the Upanishads, that their teachings are in reality much clearer, more definite, and more precise than at first sight appears. One part exactly fills up and completes the other; and a well-defined unity of thought pervades the whole. In the third answer in this Upanishad, the teacher turns from the macrocosm to the microcosm; from the universe to man. Let us once more touch on the outline of universal evolution. From the eternal springs the Evolver, who expanding through the Word, produces the fivefold outer universe. Exactly in the same way the microcosm, man, is formed. From the Self (Atma) springs the Life, which expanding through the Soul (Buddhi), produces the five inferior lives, or lower principles in man. These three powers, the Self, the Life, and the Soul, make up the divine, eternal nature of man, which necessarily and perpetually stands within the threshold of the eternal world; and is by its very nature immortal. This divinity and immortality of the Higher Self, as a fact already existing from the beginning, is one of the most characteristic doctrines of the Upanishads. The whole aim of their teachings is this: to point the path by which the personal self may win immortality and divinity, by becoming united with the Higher Self, which always possessed immortality and divinity. We have, therefore, the Self (Atma), its Life, and the Soul (Buddhi) making the divine nature of man; the Higher Self. The ‘upward-life’, or advancing personal self is the link between the higher and lower nature. And the lower nature is then described, as linked with the different planes or fields of the outer material world; the lowest being the ‘downward-life’ or animal passions, which is spoken of as of the earth earthy. By the gradual turning of the personal life from the animal to the god, he gains immortality,—he gains immortality. ‘But the life-fires are awake within this dwelling. The downward life is as the household fire; the distributing life is as the fire of offerings; as the forward life is brought forward from this, it is as the sacrificial fire; inbreathing and outbreathing are the secondary offerings, the uniting life is as the fire which unites them. ‘Mind is as the sacrificer; and the fruit of sacrifice is as the upward life; the upward life leads the sacrificer day by day to the eternal. ‘So this bright one (mind) enjoys greatness in dreams; what has been seen he beholds as seen; what has been heard he hears again; and for the other powers, he experiences again what has been experienced. Things seen and unseen, heard and unheard, experienced and unexperienced, manifested and unmanifested, he beholds all; being all, he beholds it. ‘And when he (mind) is wrapped round by the Shining one, then the bright one beholds no dreams, then in the man that bliss is attained. And as, dear, the birds come to rest in the tree, so all this comes to rest in the Higher Self. ‘Earth and things of the earth, water and things of water, fire and things of fire, air and things of air, ether and things of ether, vision and the visible, hearing and the audible, smell and smell-able, taste and taste-able, touch and tangible, speech and speak-able, hands and what is handled, feet and going, thought and thinkable, intelligence and intelligible, personality and the personal self, consciousness and being conscious, the shining one and shining, life and living. ‘For the Spirit (the Higher Self) is the seer, toucher, hearer, smeller, taster, thinker, knower, doer, the discerning Self. And the Spirit rests on the Supreme Self, the Eternal. ‘He verily reaches the Supreme Eternal, who knows that shadowless, bodiless, colorless, shining Eternal. He verily, dear, becomes all-knowing; he becomes the All. ‘If he meditates on it with one measure (of knowledge), enlightened by it, he is soon reborn in the world. The Rig verses bring him to the world of men; he there gains power through fervor, service of the Eternal, and faith. ‘So, if he meditates on it with two measures (of knowledge), he is led to the middle world by the Yajur verses. This is the lunar world. After enjoying brightness in the lunar world he is born again. ‘But he who meditates on Om with three measures (of knowledge) and through that sacred Om meditates on the highest spirit, he, verily, is wrapped in the shining one, in the sun. —Three measures are appointed, united together, and yet subject to death when divided. When the three, the outer, the middle, the inner, are again united, then the wise one is freed from fear. —By the Rig to this world, by the Yajur to the middle world, by the Sama to the world the Seers know. By meditating on Om, the perfect knower gains the supreme world of peace, unfading, immortal, fearless. 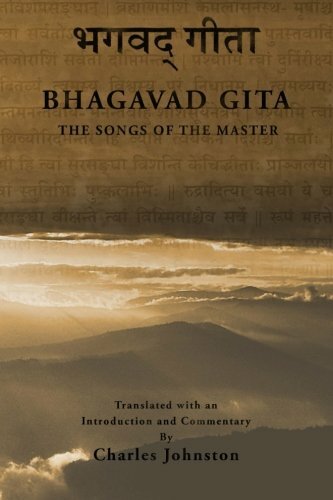 So Sukesha Bharadvaja asked him: ‘Master, Hiranyanabha, prince of Kushala, came to me and asked this question: Bharadvaja, do you know the Spirit with sixteen parts? I answered the youth: I know him not. If I knew him, how should I not tell you? For he is dried up root and all who speaks untruth! Silently mounting his chariot he went away. ‘I ask thee, then: Where is this Spirit?’ To him the Master answered: ‘Here, dear, within man is that Spirit in whom are sixteen parts. The Spirit said: In whose manifestation shall I be manifested? In whose returning shall I return? ‘The Spirit put forth life, and from Life put forth the Pure one. Then Ether and Air and Fire and Water and Earth; then Potency and Mind and Food, and from Food, Vigor, Fervor, Worship, and the Worlds; then Name among the worlds. ‘So of that All-Seer, the sixteen parts, going spirit-ward, on reaching Spirit, come to rest; their name and form are merged in Spirit, they say. ‘So Spirit is partless and immortal. —Knowing that Supreme Spirit, in whom the parts rest, like the spokes in the nave, let not death disquiet you. “I, said Life, making myself five-fold, become manifest as the five lives.” In this sentence is summarised the whole cosmic philosophy of the Upanishads. There are two thoughts, first unity, then diversity. The unity is the greater thought, the profoundest discovery of the sages, whose wisdom the Upanishads record: ‘Thou seest nothing but the eternal; nothing is but the eternal.’ Then comes the manifestation of life, the unfolding and outward presentation of the universe, and the steps of manifestation from the latency of the one unknowable eternal are always represented, in these old books of wisdom, in the same orderly sequence, though sometimes numbered differently, as the sub-divisions are broader or more detailed. It may be well to sketch again the great cosmic process of unfolding as applying to the whole universe before turning to its particular application in man, the miniature of the universe. For the eternal, the one, there is neither manifestation nor contraction, neither unfolding nor withdrawal, neither day nor night, for nothing can be added to the All, nothing can be taken from the All. The subject of unfolding and withdrawal, of manifestation and contraction, is not the eternal, but the “Logos,” the great evolver. The evolver, the Logos, has a double aspect. The first aspect is positive, the forceful substance of manifestation; the second, negative, the abstract plan or outline of the unfolding, still latent, but soon to be manifested. Then from the union of these two, the Evolver and the Voice, is made manifest the five-fold outer Universe, and this five-fold outer Universe, together with these two, the Evolver and the Voice, forms the seven-fold cosmos, which rests in the unmanifest one, the Eternal. The five-fold outer Universe is made up of five great potencies or elements, each one corresponding to a great form of perception, for, for us, the outer universe is made up of forms of perception. The five potencies or elements are generally called ether, air, fire, water, and earth, and the five great forms of perception corresponding to them are sound, touch, sight, taste, and smell. These words, however, carry far more than their terrestrial meaning and refer rather to what we should call planes of perception or of consciousness than modes of perception on the terrestrial plane. The teaching as to these planes or states of consciousness is very clear in the Upanishads, and we shall have occasion to touch on it many times. We have, therefore, these seven: the evolver, the voice, ether, air, fire, water, earth, which we may call the seven principles of the universe. They are the manifestation of life, which became dual, and then making itself five-fold produced the outer universe. These seven rest in the Eternal One. So far the first three questions and their answer by the Master in this Upanishad carried the teaching as to the manifestation of the macrocosm, the “great world.” The questions and answers which conclude the Upanishad apply the same thought to man, the “little world” or microcosm. For the unity between the macrocosm—the outer universe—and the microcosm—man—is ever present in the Upanishads, underlying every part of them, and often stated with perfect explicitness and lucidity. Corresponding to the Eternal, the one in which all others rest, in the macrocosm is the Self, Atma, the one in whom the other principles of man “are set like the spokes in the nave”. Then this Self, as active and positive, is called Life, the Higher Self, “who, though one, disposes the desires of many”; the Higher Self, which, resting outside the cycle of lives, puts forth as its representatives innumerable personal selves, who reap for it the harvests of experience through the whole series of rebirths. This positive aspect of the Self as the disposing life has a negative or passive aspect, corresponding to the feminine universal voice, and to this feminine or passive aspect of the Self several names are given in the Upanishads. This passive aspect is called “Wisdom” (Buddhi), or “Shining” (Tejas); but the thought underlying it is almost the same as that underlying Vach, who is also called the “Shining” (Viraj). The “Wisdom”, or the “Shining” (Buddhi) is for man what Vach is for the universe, the abstract plan of manifestation through the cycle of lives; the invisible outline of the universal law applied to man. We might run the risk of materialising a spiritual concept by saying that it is a crystal model of the whole life of man from the beginningless beginning to the endless end; that all the laws of man’s life in all the spheres are outlined in this model, to be gradually illuminated as these laws are realised in the gradual unfoldment of the Higher Self through the experience of the whole series of personal selves, in the cycle of birth and death. Thus as the potential life of the Higher Self is gradually realized, the passive “Wisdom” (Buddhi), becomes the active “Shining” (Tejas). Then this dual life of man “becomes five-fold and manifests as the five lives”. The five manifested lives or principles of man are variously named. One series is the “upward-life” (Udana), the ‘‘uniting-life” (Samana), the ‘‘forward-life” (Prana), the ‘‘distributing-life” (Vyana), and the “downward-life” (Apana), and they are further correlated with the five great elements or outer modes of the macrocosm, the manifested universe. From another point of view, the five manifested lives or principles, of man are called “mind” (Manas), ‘‘desire”, “vigor”, “form”, and “senses”. But by far the most important for us in either category is the first, the “upward-life”, or ‘‘mind”, which stands next to the dual life and wisdom of the Higher Self. For this “mind” or “upward-life” is the conscious centre of the personal self, which is the minister and representative of the Higher Self throughout the whole series of rebirths. Whether spoken of as “mind” or as the “upward-life”, this centre of the personal self is invariably represented as dual. “Mind” (Manas), is either restrained by the Higher Self, “like the well-ruled horses of the charioteer”; or unrestrained, “like the unruly horses of the charioteer”. The “upward-life” is either “wrapt by the shining” or “not wrapt by the shining”, and on this dual tendency, this double potency of “mind” and the “upward-life” (for they are identical), depend the most momentous issues for the personal life. And this double potency of the personal life is no mere subtlety of metaphysics. It is a fact of daily and hourly experience, the great fact of life, the perpetually verifiable truth on which the whole mystery of life depends. We stand, as it was said, between the wild beast and the god, between the angel and the demon. We can consciously at every moment throw in our lot with one or the other; can consciously at every moment incline to one or the other, and it is the sum of these decisions which make up the fate and destiny of the personal self, whether in one life or in a long series of lives. When the two, the upward and downward, are fairly balanced, when aspiration upward and desire downward alternate without any clear or conscious deliberation—the condition of the unthinking mass of men—then the two “lead to a human world”; or, in other words, to a new rebirth in this terrestrial life of ours. And so long as these two tendencies are fairly balanced, so long as men go on sinning and repenting, half-conscious, half-responsible, so long will this series of rebirths continue. When the time of full consciousness and full responsibility comes, if the upward tendency prevails, “mind,” the “shining,” and the “self” become reunited and the mortal puts on immortality. As in the whole series of lives, so in a less degree for each personal life. And as for each personal life, each terrestrial span, so for the measures of that span, the single days. For each day is a little model of eternity, as each man is a little model of the universe. But the more detailed teaching as to the days and the lives—as to night, the death of the day, and death, the night of life—will be more fully treated when we come to the Upanishads, which treat especially, of the states of consciousness, which are quaintly called “the measures of the sacred Om”. So the “Upanishad of the Questions” is ended; the most dramatic and concise of the Upanishads, perhaps, as the Katha, the “Teaching of Death to Nachiketas” is in some respects the most profound and beautiful. In the six questions and their six answers are summed up the teaching of all the Upanishads, all that Narada and the seven Sages knew. To retain a clear and lucid memory of this Upanishad of the Questions it will be well to note and remember each question and each answer in their order, and further to tabulate in some degree the scheme of the universe put forward. But it must be clearly remembered that tables of words are not groups of ideas, and that the full meaning of the teaching is only grasped when the ideas rather than the words are realized. The Upanishad of the Questions contains in brief the whole philosophy of the old sages and their solution of the problems of life. It is, in truth, a manual of the mysteries.